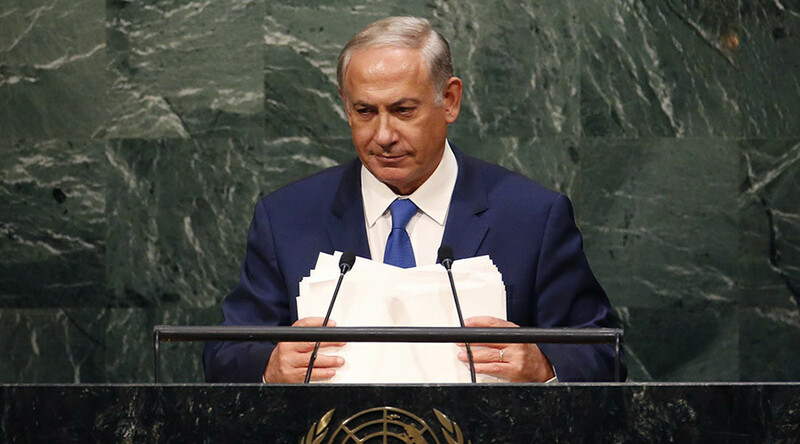 In his speech at the UN General Assembly, Israeli PM Benjamin Netanyahu accused Iran of aggressive behavior and sharply criticized the nuclear deal with Tehran. He also addressed relations with Palestine and berated the UN for alleged anti-Israeli bias. The nuclear deal with Iran “doesn't make peace more likely,” but only fuels Iran’s aggression with billions of dollars and sanctions relief, thus making “war more likely,” Benjamin Netanyahu said as he addressed the UN General Assembly on Thursday. He then accused Iran of continued and consistent aggression. Netanyahu claimed that “only in the last six months” Iran boosted “supplies of devastating weapons” and sent Revolutionary Guard soldiers along with Shia fighters from Afghanistan and Pakistan to Syria. Additionally, Netanyahu accused Iran of planning to open “two new terror fronts against Israel” in West Bank and Golan Heights as well as of setting up “terror cells” all over the world including in the western hemisphere. The Israeli Prime Minister claimed that sanctions relief would allow Iran to dramatically expand its aggressive policy “devouring more and more prey." “Unleashed and un-muzzled, Iran will go on the prowl, devouring more and more prey,” Benjamin Netanyahu said in his speech at the UN General Assembly. “When bad behavior is rewarded it only gets worse,” he added. Apart from attacking Iran and criticizing the nuclear deal, Netanyahu also sharply criticized the UN itself for silent support of Iran’s actions and what he called an anti-Israeli bias. He also slammed the UN for what he called an “utter, deafening silence” in response to Iran’s threats to destroy Israel and then remained silent for about 40 seconds apparently to attach weight to his words. He also reaffirmed Israel’s commitment to an alliance with the US by calling the differences about the nuclear deal “a disagreement within the family” and stating that, in fact, the two countries have no disagreements. He also stressed that he is committed to the two-state solution and the mutual recognition of Israel and Palestine. He blamed Palestinian Authority President Mahmoud Abbas for refusing to negotiate and demonstrating “rejectionism” referring to the Abbas’s speech at the UN General Assembly on Wednesday. “If we actually do that, we can do remarkable things for our peoples,” Netanyahu said.